Keep Norfolk Beautiful is the Norfolk affiliate of Keep America Beautiful. They are holding Keep Norfolk Beautiful Day on May 3, 2014. Suburban Acres Civic League and Wards Corner Civic League have both scheduled cleanup events as a part of Keep Norfolk Beautiful Day and The Great American Cleanup. Your help and attendance is needed! Wards Corner asks that you meet on Saturday, May 3rd at our Adopt-a-Spot area (Ruthven and W. Little Creek). The Cleanup begins at 8am and only takes about an hour. Gloves, trash bags and safety vests provided. Questions?? Call Ray Duron 423-4337. The Wards Corner public art selection committee met last week on April 22 at Wards Corner with the chosen artist, Gordon Huether. Karen Rudd, Manager of Norfolk’s Cultural Affairs, was in attendance as well as various City department staff and a representative from the developer of K & K Square. Huether walked and drove the Wards Corner area and reached a recommended location in the median on Granby Street at the current location of the Wards Corner Mermaid sign located just south of the intersection with North Shore Rd. Huether preferred this location to something closed to the intersection of Little Creek and Granby as it has less audio and visual noise. It is hoped that the art can replace the current sign and be a gateway piece that may incorporate a new Wards Corner sign. Huether will mock up a few different options and bring those back to the selection committee in the near future. Moe’s Southwest Grill opens Thursday, May 1, 2014 at its new Wards Corner location. The new store is located at the Corner of Granby St and E. Little Creek Road in the new K & K Square shopping center anchored by Harris Teeter. Founded in December 2000 in Atlanta, GA, Moe’s Southwest Grill® is a fun and engaging fast-casual restaurant franchise serving a wide variety of fresh, made-to-order Southwest fare in a welcoming environment that rocks. The first thing you’ll hear when you walk into the restaurant is an enthusiastic, “Welcome to Moe’s! ® ” It’s more than just our rally cry. It embodies the entire culture. Everybody is welcome at Moe’s. Except, of course, fugitives. With more than 20 incredibly fresh ingredients like all-natural chicken, grass-fed steak and organic tofu to create one-of-a-kind meals, Moe’s has everyone covered, from meat lovers to tree huggers to vegetarians and flexitarians. While we are best known for our awesome burritos, our menu also features kids’, vegetarian and low-calorie options – all served with free chips and salsa. The only thing we don’t have: microwaves. From our menu items with fun, pop-culture inspired names like Earmuffs, Wrong Doug, Close Talker and Joey Bag of Donuts to our killer, hand-selected playlist of tunes that pay homage to dearly departed musicians, it’s safe to say we roll to our own beat. Moe’s currently serves the most awesome Southwest fare at more than 500 locations in the United States and abroad. In August 2007, Moe’s Southwest Grill joined FOCUS Brands Inc. Atlanta-based FOCUS Brands Inc. is the franchisor and operator of over 4,300 Carvel® Ice Cream, Cinnabon® Bakery, Schlotzsky’s® Deli, Moe’s Southwest Grill®, Auntie Anne’s® Pretzels and McAlister’s® Deli locations, as well as the franchisor of Seattle’s Best Coffee® on certain military bases and in certain international markets. April 24: An information session is scheduled at Lafayette-Winona for parents of rising LWMS sixth-, seventh- and eighth-grade students. At the meeting, parents will receive an overview from Dr. King, followed by a personalized letter from the principal of their proposed receiving middle school and a presentation from that principal. Parents also will receive information about specialty programs such as the Academy of International Studies at Rosemont (5:30 p.m. at LWMS). closure (6 p.m. at LWMS). City Manager Marcus Jones presented his 2015 City Budget last night to City Council. It is a whopping 652 pages. You can view it on the City of Norfolk website here. I have also put a copy on Wards Corner Now’s servers for download (17MB, PDF). Project Description: Provide funds to rehabilitate failing concrete pavement along Terminal Blvd. The roadway consists of a reinforced concrete surface that was built by Virginia Department of Transportation (VDOT) in 1973. It carries over 6,000 trucks in each direction daily. The total cost to repair the road by replacing sections of concrete is estimated at $7.0 million, $3.5 million for each side of the road. This project is partially funded through the VDOT revenue sharing program at 50 percent of the total project cost. This budget proposes $1,750,000 in 2015 and $1,750,000 in the 2016 budget. Project Description: Provide funds to support activities outlined in the Wards Corner Neighborhood Plan. Funding for this project also supports land acquisition, infrastructure improvements, and redevelopment initiatives that allow the strategic revitalization of the area in accordance with the Wards Corner Neighborhood Plan. Norfolk Redevelopment and Housing Authority (NRHA) will provide support to this project in an effort to meet the goals of the Wards Corner Neighborhood Plan. Marcus proposes $1 million in this 2015 budget for the Wards Corner plan. We can assume that this money will go to the continued efforts to purchase and remove the blighted properties in and around Denby Park. Coming soon: A new Granby Street bridge? This proposed budget allocates $1,000,000 to the above bridge repair and replacement. Included in that allocation is money for the design of a (new?) Granby Street Bridge. The current span was built in 1979. It is 992.1 feet long and handles about 30,000 vehicles per day. 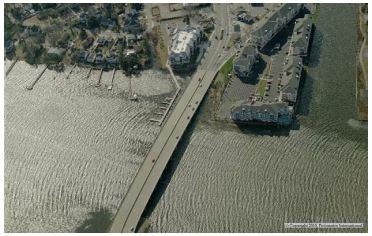 It was last inspected by VDOT in October of 2012 at which time the deck condition was rated as Satisfactory and the Super & Sub conditions were Fair. Council Members Barclay Winn, Andy Protogyrou, and Terry Whibley, and Mayor Paul Fraim were present. Future police reports will include the entire area of the Greater Wards Corner Task Force so that neighborhoods will know what is happening throughout the area. Karen Rudd, Manger of Norfolk’s Cultural Affairs, provided an overview of the artist who was selected to design the public art for Wards Corner. Gordon Huether of Napa, California, will come to Norfolk in several weeks to look at the area and meet with the public arts selection committee and the developers of K&K Square and Midtown Shopping Center. The City has allocated $150,000 for the project, which should take about a year to complete. The City’s public art program is funded through donations and from a set-aside of 1 percent of all Capital Improvement Projects over $500,000. Norfolk leads the way in the region in its support of public art projects. Karen Mayne reported on a meeting between the Norfolk Right-of-Way/Transportation staff and task force representatives. 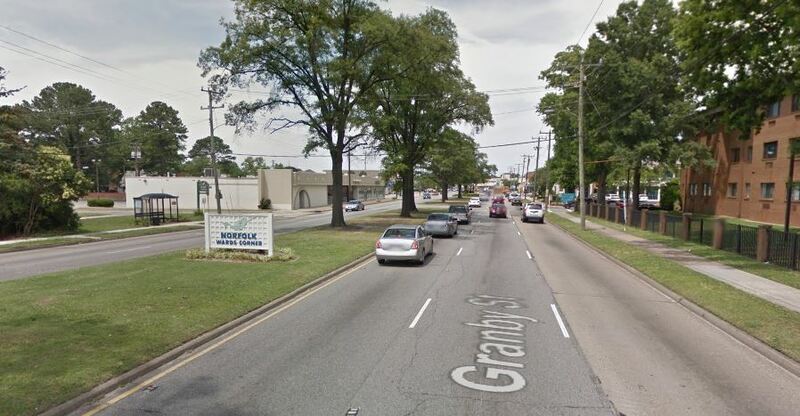 The group discussed traffic congestion and signaling around the intersection of Little Creek and Granby Street. Traffic engineers will wait to see how traffic moves through the intersection at the new K&K Square before deciding whether to turn the right northbound lane on Granby Street at Little Creek Road into a right turn only lane. There is concern that doing so could create a hazard to pedestrians. The new traffic light that will be installed on Little Creek Road between the K&K Square and Midtown Shopping Center should help with traffic in that area. It was requested that the City consider reestablishing the audio-visual crossing signal for pedestrians at that light, but the FHWA has new rules that may make such a signal cost prohibitive. The issue of illegal left turns coming out of Virginian Drive onto Little Creek Road has no structural solution due to the narrowness of the road; enforcement is the best solution. The City will be repairing/replacing the faux-brick crosswalks with a new and stronger material. Sam’s Club will rebuild at the old K-Mart property after demolishing the building. Wal-Mart is proposing a gas station as part of this project. The Albano’s Cleaners in Titustown on Little Creek Road is closing. The company is restructuring its business. A new Albano’s will be at K&K Square. The demolition of the Denby Park properties acquired by the City last year was delayed by the winter weather and should be completed in May. The rezoning of the Talbot Hall property to allow for the construction of 14 private homes and roads will go before the planning commission on April 24. Dr. Barbara Laws of Norfolk Public Schools has been named the 2014 National Supervision/Administrator Art Educator of the Year by the National Art Education Association. The award recognizes exemplary contributions, service, and achievements of art educators. (Dr. Laws also serves on the committee that selected Gordon Huether for the public art at Wards Corner.) Congratulations, Barbara!! Reminder: Wards Corner Community Day at K & K Square This Saturday! 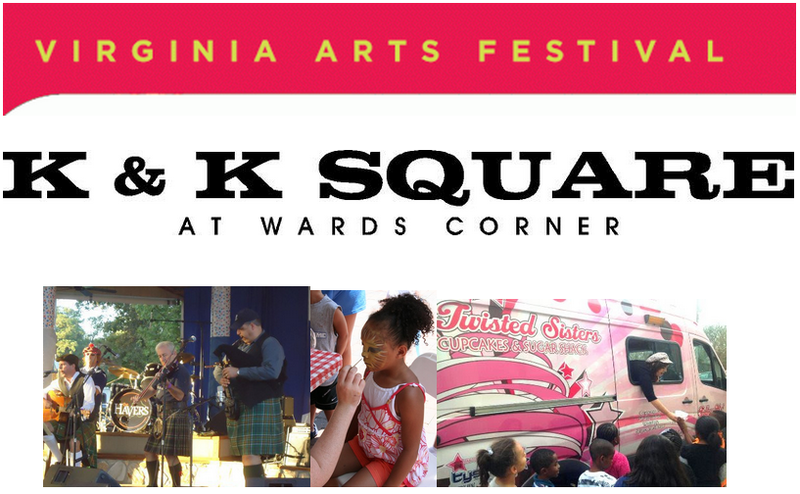 The merchants of K & K Square and the Virginia Arts Festival have planned a fun filled day for families to enjoy the wonderful new shops and services in their neighborhood. Enjoy live music, food and raffle prizes, mini cupcakes from Twisted Sisters and activities for the entire family. Kids will definitely have lots to do, from a bounce house, to face painting, to stilt walkers, jugglers and crafts. All of the activities are outside, so come and go as you please. Join the wonderful merchants of K &K Square; Harris Teeter, Subway, Moe’s Southwest Grill, Starbucks, TowneBank, Albano Cleaners, GNC, nTelos, and Great Clips as they welcome you to Wards Corner Community Day at K & K Square. Raffle Prizes include: Gift Cards to Starbucks & Moe’s Southwest Grill, Tickets to Virginia Arts Festival performances of Dance Theater of Harlem, Ben-Hur, and Virginia International Tattoo, Kindle, Blu-Ray Player, $500 Harris Teeter Shopping card, and even an iPad Air! You are currently browsing the Wards Corner Now - Wards Corner, Norfolk, Virginia blog archives for April, 2014.